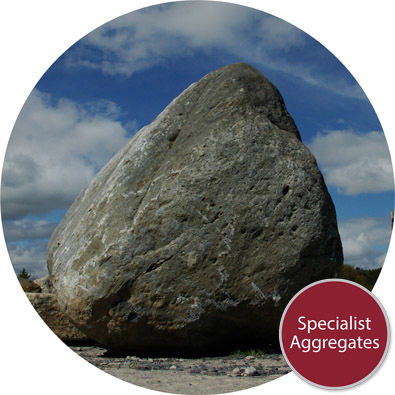 Safety Considerations specifically regarding large feature stones. Throughout "feature stone" is taken to imply any and all types of stone as supplied. It is unlikely that members of the public will have the experience and expertise to place feature stones in excess of 50kg weight and specialist professional advice should be sought. 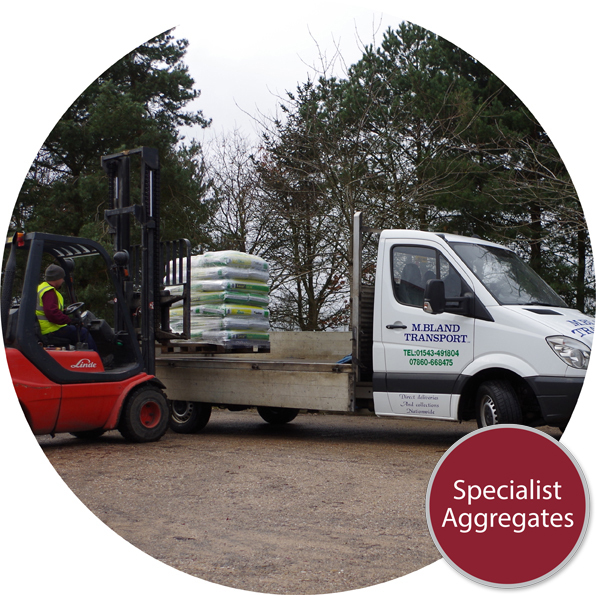 Specialist Aggregates accept no responsibility for the handling of feature stones once delivered. Whilst in no way to be regarded as exhaustive or definitive, the following suggests key areas for consideration. Feature stones are heavy and as such present a hazard. 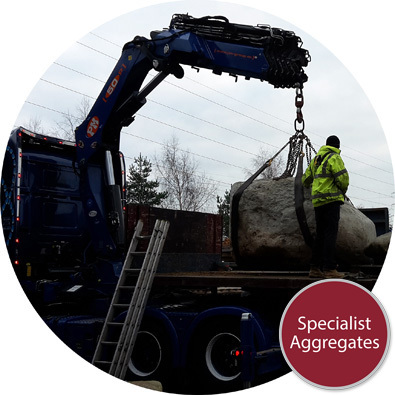 Particular care should be taken to prevent accidents occurring during the unloading from delivery vehicles, movement and placement of feature stones. The irregular shape of stones can make movement potentially unpredictable. Principle hazards include the potential for crush injuries, fractures and abrasions. Risk assessment, and method statements should be established before accepting delivery of feature stones. Location if required for reservoirs for water features. Long term stability of the feature stone. Consideration should be given to the location of a suitable area to accept delivery of feature stones and also the delivery point to the final site location. 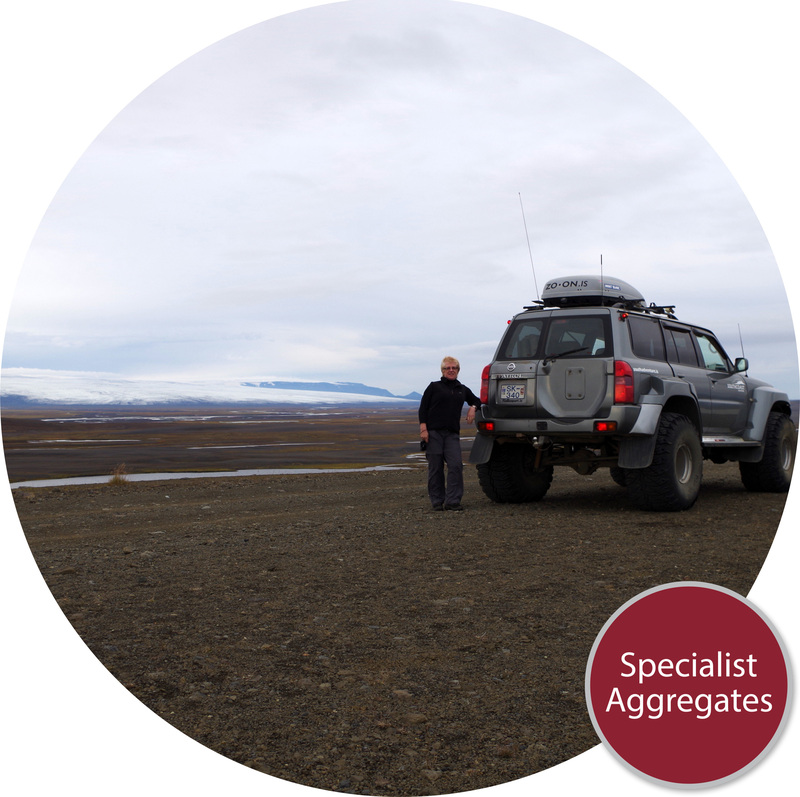 Unless otherwise agreed feature stones will be off-loaded from the delivery vehicle by the courier. Off-loading must be made to a suitable level hardstanding. Where off-loading is facilitated by the customer or his representative it is essential that the method of off-loading is established as suitable for purpose. 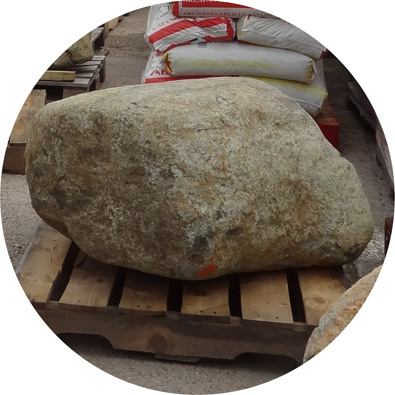 The weight and irregular shape of stones may make off-loading unpredictable. Care should be taken to ensure that all personnel are kept at a safe distance from both off-loading equipment and products. Whilst feature stones are selected to be "sound", movements during off-loading may cause stones to crack without warning . Care should be taken to keep a safe distance from stones during off-loading operations. Movement of stones to their final position can present a hazard in particular where ground conditions are slippery and uneven. 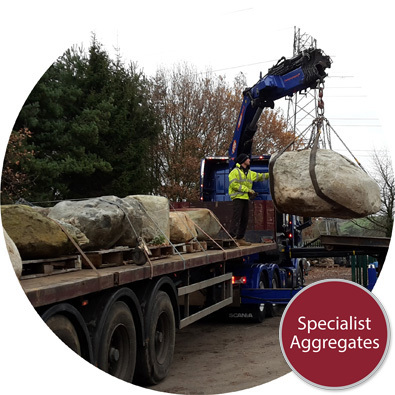 Ensure that facilities utilised for moving feature stones are established as suitable for purpose. The weight and irregular shape of stones may make movements unpredictable. Care should be taken to ensure that all personnel are kept at a safe distance from moving equipment. Whilst feature stones are selected to be "sound" movements may cause stones to crack without warning . Care should be taken to keep a safe distance from stones during movement and placement. Suitable foundations should be established to accept feature stone prior to placement. Where specified, feature stones have a flat cut base, however, this does not imply stability. In all cases care should be taken to establish suitable foundations to ensure stability during initial placement and in the long-term. The weight and irregular shape of stones may make placement unpredictable. Care should be taken to ensure that all personnel are kept at a safe distance from moving equipment, and clear of the potential of toppling of the stone being placed. Whilst feature stones are selected to be "sound" movements may cause stones to crack without warning . Care should be taken to keep a safe distance from stones during placement. Particular care should be taken with regard to the stability of stones intended as water features. In particular to the location and suitability of water reservoirs with regard to maintenance and long term stability.